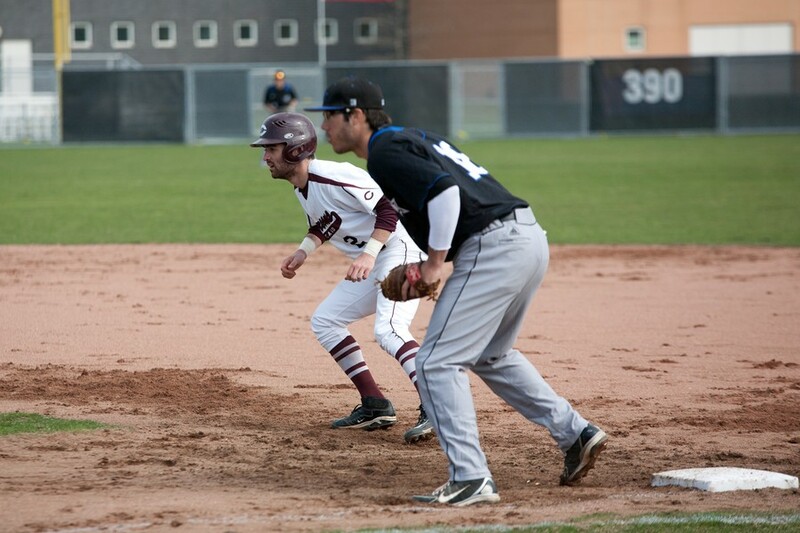 The Maroons made a resounding impression on their opponents this week as they thoroughly defeated North Central in a doubleheader on Tuesday and then beat Wheaton the following evening, running their winning streak to four. Chicago (21–11) first swept North Central (16–18), winning by scores of 10–8 and 3–0. The Maroons followed this solid performance with a much larger margin of victory, beating Wheaton (12–23) 12–1. In game one, the North Central Cardinals drew first blood in the bottom of the first when Vito DeRango scored on a throwing error by third-year shortstop Dylan Massey. Massey redeemed himself shortly, however, when in the following frame he plated Chicago’s first run with a single to left field. Two more runners scored in the top of the second, putting the Maroons ahead early. After the Cardinals put up three in the bottom of the third, Massey ignited the South Siders in the fourth, leading off the inning with a single. Fourth-year infielder Steven Schwabe drove Massey in with a double, and he and fourth-year catcher Tony Logli went on to score on wild pitches. Chicago scored one more run in the sixth and three in the seventh. This substantial lead prevented a late rally in the bottom of the seventh for North Central to have any significance, leaving the Maroons with their first win of the day at 10–8. The second game exhibited Chicago’s other strength as of late: its starting pitching. Second-year Andrew VanWazer pitched a complete game shutout on eight hits with four strikeouts and three walks. All of the runs came off fourth-year J.R. Lopez’s bases-clearing double in the top of the first, setting the score where it would stay for the rest of the game at 3–0. “J.R. is a great hitter, and his career stats signify that. He’s batting in the five-hole now, and that’s allowing him to drive in runs when the first four guys in our lineup reach base,” VanWazer said about Lopez’s recent offensive success. When asked about his performance in game two, VanWazer was quick to give praise to his teammates. “Tony Logli and I were on the same page all game. I was fortunate to have good defense all day, especially on some nice plays from [third-year outfielder] Ricky Troncelliti and Lopez,” he said. On Wednesday night, the South Siders brought both their hot hitting and dominant pitching to trounce the Thunder. Fourth-year Matt O’Connor continued to exude supremacy on the mound, going the distance and giving up only one run on four hits with six strikeouts and three walks. “I think a lot of our success recently can be attributed to strong outings from our pitchers. [First-year] Lucas Friss threw great during his last outing against Wash U, Andrew [VanWazer] and [fourth-year] Drew [Nicholson] both had great outings against North Central, and Matt [O’Connor] continued his great season on the mound last night against Wheaton,” Massey said, applauding the Maroons’ recent brilliant pitching. Massey has also been a factor in Chicago’s recent success, considering he went three for four against Wheaton following his strong showing the night before. Massey is VanWazer’s choice for the Maroons’ recent standout performer. “Dylan Massey was four for six on the day after getting injured in game two and then hit by a pitch. He battled through it and had a great day all around,” VanWazer said. Chicago scored two in the second, three in the third, and one more in the fourth with no response from Wheaton. The South Siders broke open the scoring even further with a five-run sixth. Fourth-year outfielder Jack Cinoman drove in two with a triple and scored on a single by second-year infielder Kyle Engel. The tandem repeated this formula in the seventh as Cinoman singled up the middle and Engel immediately followed with an RBI double, capping the Maroons’ scoring at 12 for the day. “[Fourth-year outfielder] Ben [Bullock], Steve [Schwabe], Jack [Cinoman], and Kyle [Engel] hit as well this week as they have all season. J.R. [Lopez] had a slow start this year, but he’s starting to see the ball well, and he’s hitting line drives to all parts of the field,” Massey said. “As for me, I’m just playing loose and enjoying the last couple weeks I have with this senior class. They’ve put a lot of work into this program, and we’re going to miss them when they leave,” he said. The Maroons have a chance to continue their recent success as they travel to take on Concordia (28–5) today at 3 p.m. and Carthage (16–19) on Sunday at 1 p.m.